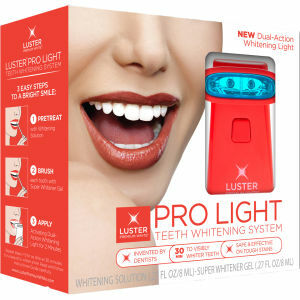 Designed to whiten yellowing teeth, the Luster Pro Light Teeth Whitening System is an innovative new way to achieve a Hollywood smile in the comfort of your own home. Created by dentists, the unique technology of this system works after just 30 minutes, reducing stains created by coffee, natural discolouration and smoking. Complete with a dual-action light. K.D. This product is not recommended for use by anyone under 14 years of age, individuals with gum disease, gingivitis, bleeding or severely receding gums, tooth sensitivity, pregnant or nursing mothers. Do not use while wearing dental braces. This product only works on natural teeth. It will not harm fillings, crowns and caps, but it will not whiten them. Do not exceed recommended light exposure time. Do not stare into the Dual-Action Whitening Light during operation as it may be harmful on the eyes. Use for period longer than 14 days should only be under the advice and supervision of a dentist. Discontinue use immediately if irritation or rash develops.